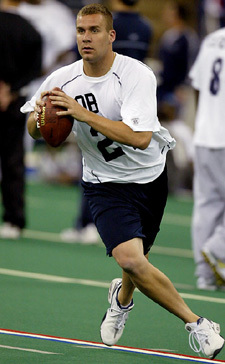 The 2013 NFL Combine begins later this week, February 23rd through the 26th. More than 300 top prospects for the upcoming NFL Draft will be invited to participate at Lucas Oil Stadium in Indianapolis. “It’s remarkable how far he has come in such a short time. Until his senior year in high school, he was a receiver. Yet, he was talented enough to take the Mid-American Conference by storm. That might not seem like a ringing endorsement on the surface, but remember that the last two MAC quarterbacks to do that were Chad Pennington and Byron Leftwich, both of whom appear to have bright NFL futures. Roethlisberger, who declared himself eligible for the NFL draft after his junior year, has a good pro arm, is more athletic than Eli Manning and Philip Rivers and sees the field well. Scouts generally believe he has the highest upside of this year’s QB crop, but also represents the greatest risk because of his limited experience.” — The late Joe Stein, NFL Draft expert for the San Diego Union-Tribune. The inquiry at the top of everyone’s list? It’s a question he can’t answer. He knows where he wants to be drafted. About six weeks ago, Roethlisberger moved to Newport Beach, Calif., and began a rigorous workout regimen. Roethlisberger and Manning are at the six-day NFL combine in Indianapolis, where prospects show off their physical and mental skills. It also gives teams a chance to interview and get to know the players. The article is still available online and can be read here. “There are plenty of hesitations within the league when it comes to expecting early results from a highly rated junior quarterback, and the track record of such picks is less than comforting. Yes, Ben Roethlisberger was the exception to the rule in 2004. 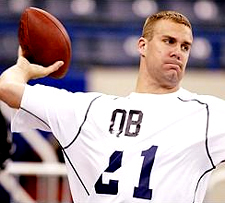 But for every Big Ben — and there’s only one — there have been an Alex Smith, a Tim Couch, a Ryan Leaf, a Heath Shuler or an Andre Ware.” – Don Banks, from his column on the NFL Combine, Sports Illustrated. Next month Part II of Ben’s “Path to the Draft” will highlight his Pro Day Workout.